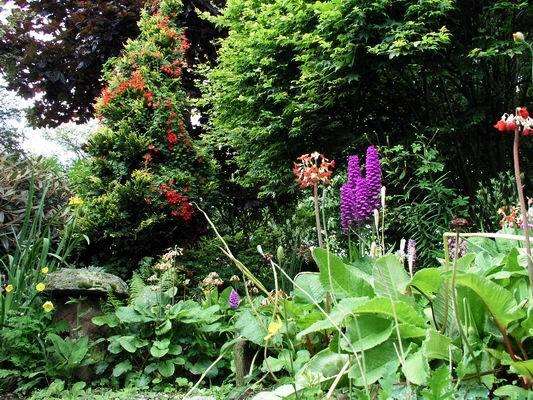 Our garden has entered its summer phase with fewer bulbs in flower but still plenty to see and do. 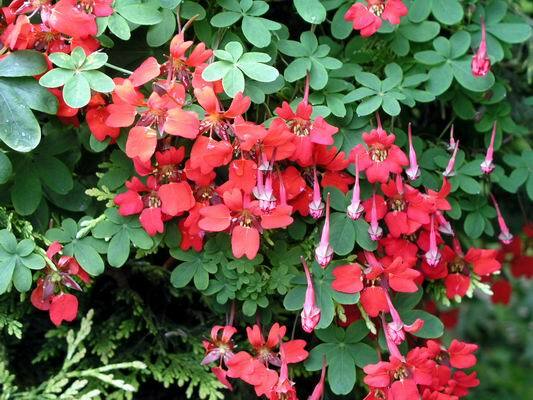 Summer is a time of pests and the 'Scottish flame flower' aka Tropaeolum speciosum is one of those in our garden. Coming from South America I can only assume it has picked up the common name 'Scottish flame flower' because it does so well in many Scottish gardens. We have to pull it out when it grows up through our smaller shrubs as it can kill them in one summer if we are not vigilant. When it grows up through a bigger conifer like above it is a very beautiful plant worthy of all the praise it gets but beware; if it likes your garden it takes off with vigour, spreading both by seed and its fat probing root system. 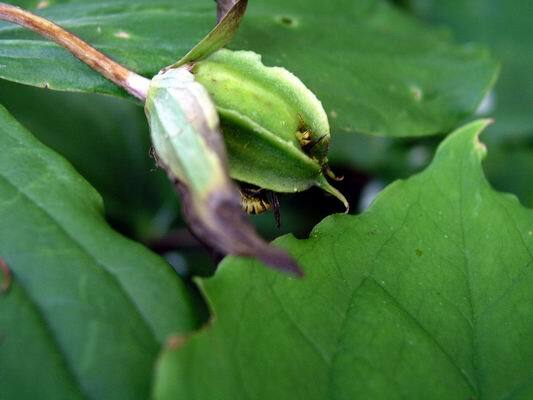 Another of my annual challenges is to collect the seed from Trillium ovatum before the wasps get them. The trouble is that the wasps are even more impatient than I am. Driven by the sweet coating that surrounds the seeds, they break into the seed capsule before it is fully ripe and make off with the seeds. Yes I have witnesses; last night the Club Treasurer, Jim and his wife, Carol, dropped in and they saw for themselves the wasps flying off clutching my seeds. I quickly took a picture (a bit fuzzy as I had to hand hold at 1/13 of a second) then I collected the capsules before I was robbed of all the seed. Still on the subject of pests I often find clutches of snail eggs when I am repotting the bulbs in the outside frames. 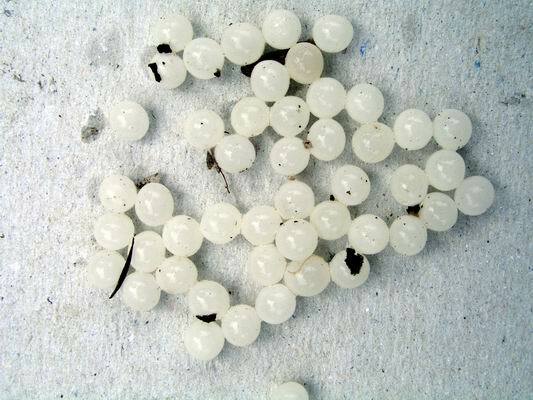 These clutches of white round eggs are laid by the large snails that we have in plenty and I usually find them at around 2cms deep in pots and troughs. 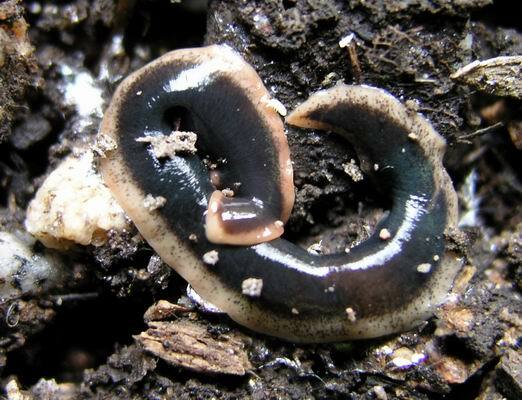 Another pest that we find mostly under the pots and troughs is the New Zealand flat worm. I have read a lot about this introduced worm about how it quickly eats all our native worms which are very beneficial to the fertility and structure of our garden soils. I find it hard to believe that these flat worms can eat all our worms that quickly - going by the size of them one earth worm probably lasts them several days at least while I have watched a hedgehog eat 10 worms in as many minutes on a wet night. So I do not think that the flat worm is such a big problem. As an alien species it is undesirable but do not be overly alarmed if you find them in your garden just squish it under your foot. Once Corydalis cashmeriana has flowered in spring the leaves die back for the summer and then the plant produces a second flush of leaves in late summer/autumn. I like to transplant or repot them between these periods of growth. The second flush of leaves you can see in this trough are emerging very early this year, due to our cold weather, but I will still repot these plants now. Not all the rhizomes have produced their second leaves yet and I do not worry about damaging or losing a few leaves; it is much more important to split the plants and get them into fresh, humus rich well drained compost. 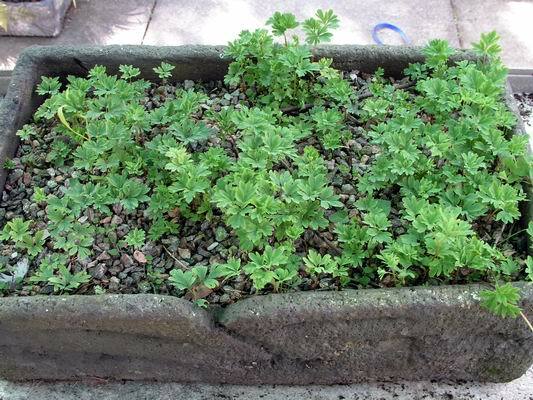 If you do not split Corydalis cashmeriana on a regular basis they will stop flowering and then start to die out - whether in containers or the garden they just love being split up and replanted on a regular basis. 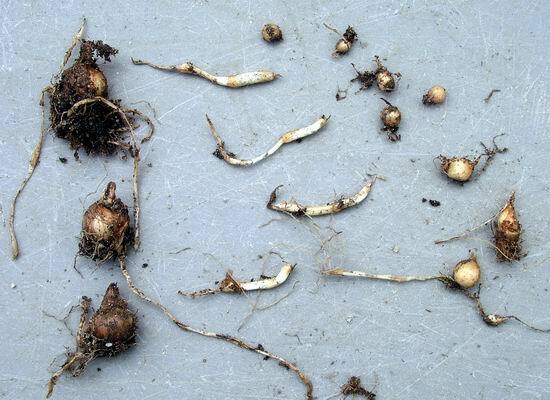 As I have said so often before the best bit about bulbs is so often hidden underground. Just look at the fantastic colour and form of these Tulipa humilis corms. Note how the withered remains of the old growth is to one side of the new bulb. 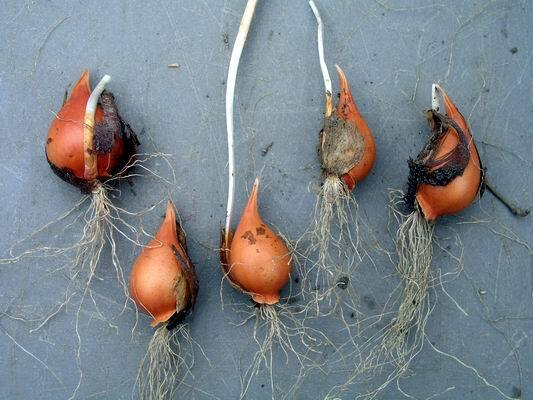 Crocus nudiflorus corms increase by stolons which extend from the base of the corm, expanding towards the end to form a small torpedo by the end of the first year and these in turn form a small corm in the next year. This small corm takes another two seasons of growth to reach flowering size. 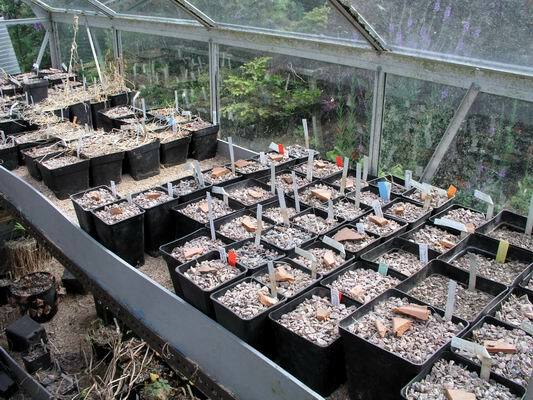 I have almost worked my way through repotting most of our Narcissus and I have moved them all into square plastic pots this year. A brave move or stupidity I ask? Well no, it is a considered development that will use the limited space we have under glass much more efficiently, but it is not without risk and I have had to make several adjustments to my regime to take into account this change - more on that in next week's log. 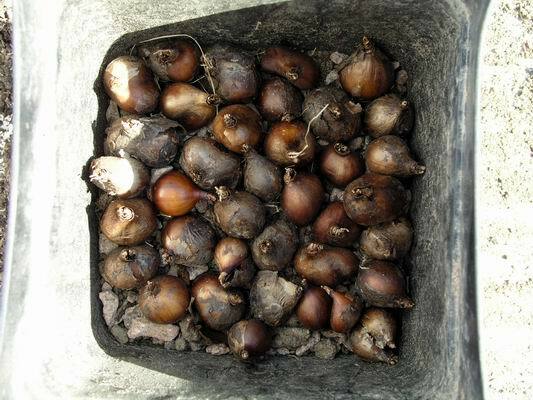 The good side of this development is I have freed up some more space to hold our ever expanding collection of bulbs. 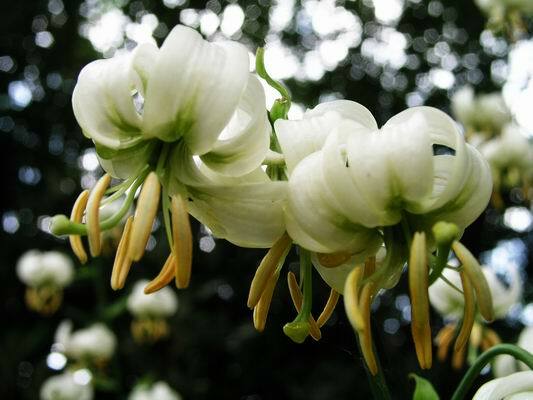 In the garden Lilium martagon album is still flowering, the white flowers looking at their best in the evening light.